If parking in the main lot off Herman drive, facing the soccer fields - follow the path on your right. 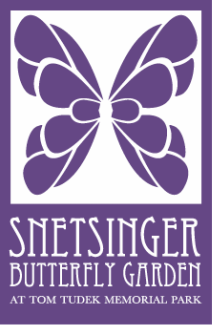 The butterfly garden is a short walk (approx. 200ft) from the parking area. If you happen to pass by the SBG these days you will notice that many changes are taking place. Most open-field sites in Pennsylvania will revert to forest sooner or later, and SBG is no exception. To continue as a butterfly habitat, the area requires active management to keep second-growth tree species and invasive shrubs and perennials from transforming the open meadow into a forest. In 2016-17 a long-term management plan was created. The SBG’s partners, Ferguson Township, Centre Region Parks and Recreation, and the Tom Tudek Trust, along with the Centre County Master Gardeners, will implement the plan over several years. In spring of 2017 many invasive shrubs and trees were removed from the habitat interior, giving it a markedly more open appearance. Meanwhile, the Centre County Master Gardeners took the opportunity to rethink the Demonstration Gardens, which are sited along the bicycle path that curves along the habitat’s southern edge. The Monarch Waystation, formerly separated from the other gardens, was moved to a spot to join the others. In 2017 a Backyard Bird Habitat Garden was added, along with a Native Shrub Showcase. A "Weird and Wonderful" garden has been under development since 2018 and a "Layered Landscape" is in the planning stages. A mowed strip between the meadow and the demonstration edge will serve double duty - providing an additional vantage point from which to enjoy the gardens while acting as a buffer from the meadow making for easier management. We're planting the seeds, literally and figuratively, for an improved habitat that will support even more bees, butterflies, and birds! Monarch Waystations are places that provide milkweed and nectar sources necessary for monarchs to produce successive generations and sustain their migration. Monarch larvae feed exclusively on milkweed, so this demonstration area showcases several species of milkweed. As monarch populations decline due to loss of milkweed and nectar sources, our goal is to create, conserve, and protect monarch habitats. This new demonstration garden showcases plants and features for supporting bird-life in your backyards. Plants featured in your garden are easy to find and easy to add to your home landscape. This garden is part of a state-wide survey to identify the attractiveness of common cultivars of tickseed and bee balm. This multi-year study will identify some of the best cultivars to include in your garden for supporting pollinators! 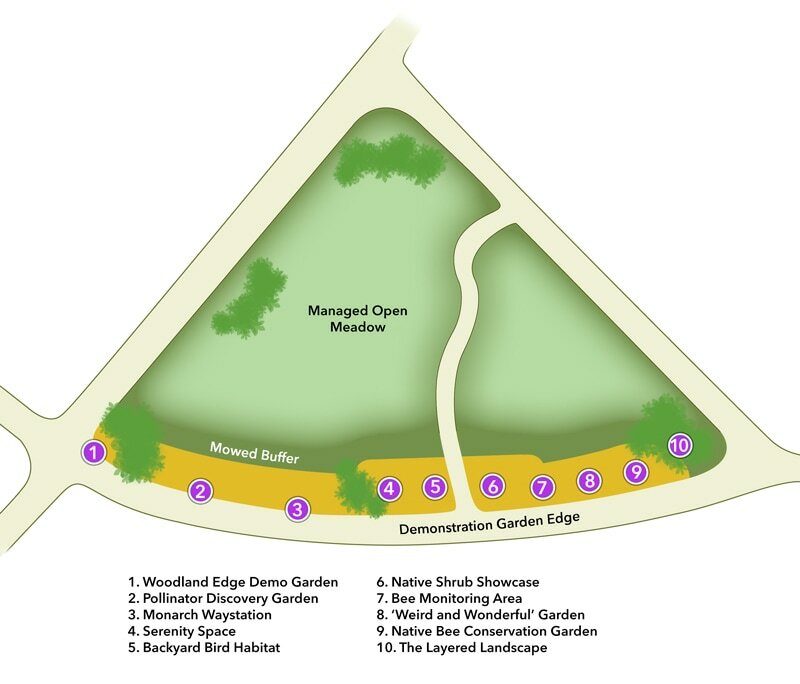 9 Native bee conservation garden and "BEE hotel"
demonstration area have been specifically chosen to be most beneficial to our native bees, by providing essential pollen and nectar sources as well as habitat. The focal point of the space is a bee and bug "hotel" that incorporates a large variety of nesting material for native bees, beneficial insects and butterflies. The Tudek Serenity Space is a healing, restorative nook that invites passersby to sit down and allow their burdens to drop away for a while. The wheelchair friendly access encourages all to experience their senses, surrounded by soothing grasses, pollinator friendly plants, and a panoramic view of Tussey Ridge. 75% of butterfly host plants are trees and shrubs. Adding native shrubs to your landscape is one of the best ways to increase populations of butterflies, birds, and other wildlife. Our new demonstration garden showcases our favorite native shrub selections. Have you heard of figwort, rattlesnake master, or giant purple hyssop? These unique plants all have special importance for pollinators. While they may not be the showiest in our garden - they're certainly some of the most interesting. Coming Soon. In the wild, ground covers, perennials, shrubs and trees all work in concert to provide a richly layered landscape supporting pollinators and wildlife at every level. Following the principles of Rick Darke and Douglas Tallamy, authors of The Living Landscape, and Claudia West of North Creek Nurseries, this corner of the habitat will be developed to highlight a complete landscape working from the bottom up. Our demonstration gardens are designed and maintained by Penn State Extension Master Gardeners of Centre County to further their mission of providing outreach and education to the community they serve.